I have received several e-mails about my MP3 student numbers and your need for numbers beyond the 25 that I had originally posted. I am SO glad that these have helped some of you out as you begin to set up your new classrooms for this quickly approaching year! Many of you have said that you have more than 25 students and so you NEED MORE NUMBERS!!! 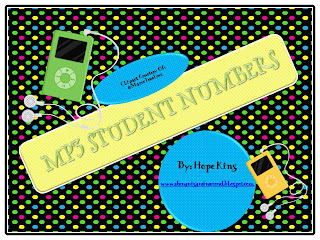 :) You can click on the picture above to download numbers 1-50 (if you have more than 50 students in your classroom...(a) I am sending up a few prayers for you...DAILY and (b) e-mail me and I will be more than happy to create more numbers! I have so many DIY projects and classroom materials that are in the works! As soon as this final grad paper is complete I will get those up and running for you! I am also excited about posting my "Camp Out...Number Style" unit next week! This is a great unit to get your students excited about math with a little review and a whole lot of fun! I hope that everyone is having an amazing weekend!!!! Check back soon for more materials!